Sierra Nevada has always been one of our choices for transitional beers. Their pale ale has helped many consumers into the world of craft brewing. Also, many of their beers stand up with the best (see our 12 Beers of Christmas.) Once any company hits 30 years, it's an great accomplishment so it's time to celebrate. To commemorate their achievement, they have collaborated with many pioneers of brewing to release four 30th anniversary ales. Having been a huge fan of their previous collaboration with Dogfish Head, Life & Limb, we couldn't resist picking up their first offering, Fritz and Ken's ale. Ken Grossman, owner of Sierra Nevada brewed this beer with the help of Fritz Maytag, owner of Anchor Brewing Company. Since this is all about working with others we have our friend and bass player Johnny V to help out with this review. Fritz and Ken's Ale is an imperial stout weighing in at 9.2% ABV. It pours jet black with a nice carmel colored head. It smells of alcohol, roasted malts, cocoa and carmel. It has strong punch in the beginning and flows down extremely smooth. You are left with a serious alcohol warmth with nice malt and chocolate flavors lingering on the tonge. The body is a bit weak with as the alcohol finishes up the back end. It must be notated that this beer in best drank at around 50 degrees. We tried this as originally around 40-42 degrees but decided to let the beer warm up. As the beer became warm, more and more flavors awoke from behind this black beauty. If this is any indication of what the other beers in this series will bring, then we will be sure to pick up the next three in the series. 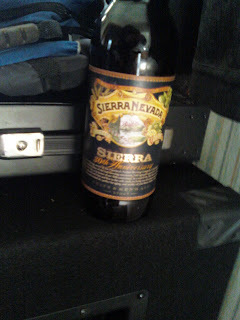 It would be great if Sierra Nevada released a year round "big" beer to introduce many others to the world of imperials. Their Torpedo is a step in the right direction and let's hope if they do decide to make a yearly four pack, they taste something like Fritz And Ken's Ale.